Planning a cruise holiday or craving some travel inspiration? Let our expert advice and destination guides pique your wanderlust. 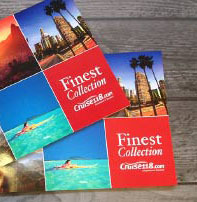 Cruise118.com Advice is full of everything you could need to get more from your cruise holidays. From local cuisine and natural wonders to practical advice and behind the scenes glimpses into on-board life, our travel and lifestyle experts cover it all. Whether you cruise for relaxation or exotic adventures, get yourself comfortable and take a peek! Should I pay attention to cruise reviews? What are the best cruise cabins?